Crusoe College was one of the original Victorian Musical Futures Pilot Schools from 2010. It is a year 7-10 College and located in Bendigo. 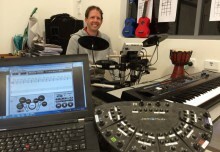 Drew Roberts (in the photo below with some of his favourite technology toys) is the sole classroom teacher at the school and has classes rocking in a strong MF program. The music room has a circle of couches and chairs in the centre of the room with all the instruments around the edges of the room, ready for playing at all times. 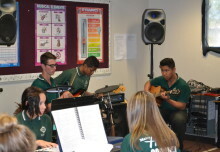 All classes are practical and students form groups around the Jamhubs or all play together in whole class bands. 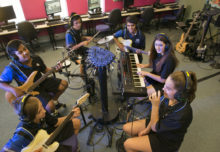 Great use is made of the digital drum kits and they like to use the Roland HD-1 Drum tutor to get all students playing basic grooves from year 7. As well as competence on the drums, Drew likes all students to be comfortable playing a range of chords on ukelele and guitar from year 7. 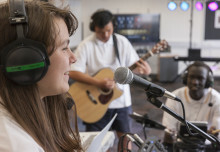 This allows students to be quite self reliant when undertaking Musical Futures work of their own interest. 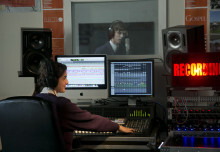 All music classes are elective at Crusoe College, and music is most popular of all the electives on offer at the school.